The first day in the park we introduced the kids to the Bible. We told them that the Bible is God's word and that everything in it is true. Every child that stayed for story time was given a Bible that day. As soon as story time was over a group of them ran to the table and started reading Genesis 1. I was blown away! One of the girls who was a part of that group has stood out since that very first day. We asked for a volunteer to pray and she basically prayed the sinner's prayer. She is always excited for story time and is so interested in what we are teaching. We have had a lot of conversations about things that she has read in her Bible. 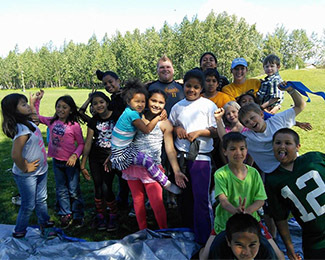 Mission Anchorage is not the only group that has missionaries doing park ministry this summer. There is at least one other organization that I know of that is doing a very similar thing in other parks around Anchorage. One Friday this girl and her brother went to a block party put on by that other group in a different park. They were having a baptism and she decided that she wanted to be baptized too. A leader at that park, a former Go Now missionary now living in Alaska, was able to speak with her about what it means to follow Christ in this way. It is exciting to see the way that God is using all groups here to serve him. I love knowing that she has a connection with strong believers that will be here long after we leave. I am praying that we will see many more, including this girls two brothers, believe in Christ and accept him as the Lord of their life. Brittany Cox is a student at Texas A&M Commerce serving as a Go Now missionary in Anchorage, Alaska this summer.